The tubes hold max of 1600 ul. Will know on Sun or Mon if either crab is infected w Hematodinium. Samples were stored at 4C O/N. The samples are extremely cloudy. I’m not sure if this is expected. Processed samples using RNAzol RT (MRC) according to the manufacturer’s protocol for Total RNA Isolation. Added 1mL RNAzol RT to pellet and mixed by repeated pipetting (solution was cloudy and slightly viscous). Added 400uL of 0.1% DEPC-treated H2O and mixed vigorously by hand. This is not normal. Usually the supernatant is the clear portion, while the blue layer is below that. Transferred 750uL of the clear portion to clean 1.7mL tube. Added equal volume of isopropanol, mixed by inversion. Appeared to be a very high amount of genomic DNA precipitation visible in the tube. 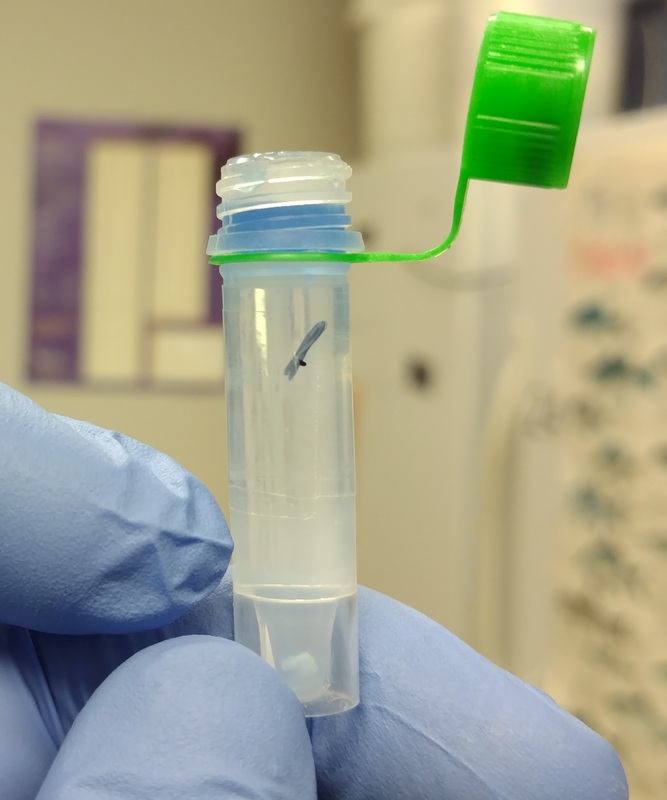 It appears that the nucleotides (the white interphase) are suspended on a “cushion” of higher density solution, instead of pelleted at the bottom of the tube. Removed/discarded higher density solution, leaving the white layer on the bottom of the tube. Washed pellet with 75% ethanol. Repeated Steps 12, 13, & 14, 1x. Resuspended RNA in 50uL 0.1% DEPC-treated H2O. Pellets did not solubilize on their own. I dispersed the pellets by repeated pipetting (P200). 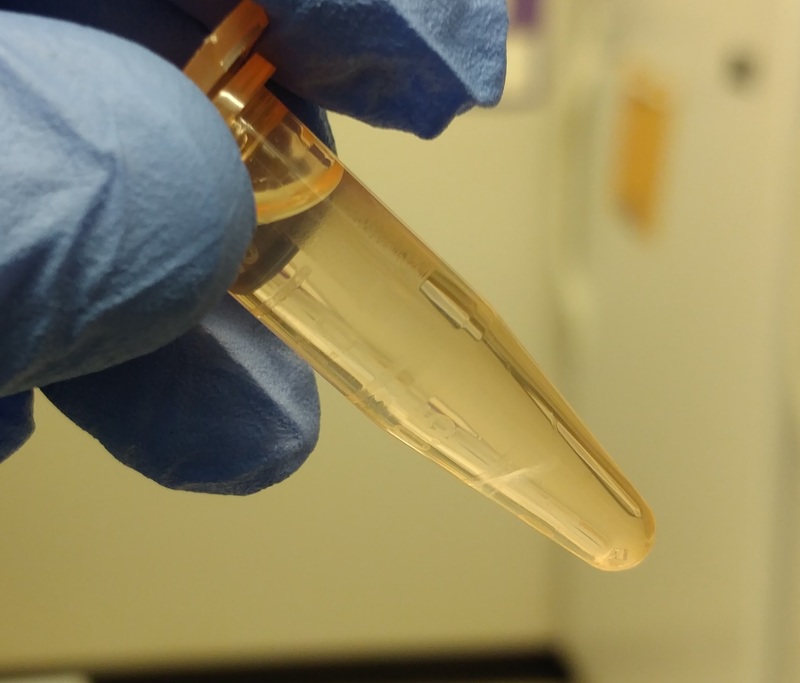 Remaining insoluble material was pelleted (12,000g, 30s) and supernatant was transferred to a new 1.6mL tube. RNA was quantified using the Qubit 3.0 and the Qubit HS RNA Assay. Used 5uL of each sample. Interestingly, both samples from the same crab had similar/decent yields. This entry was posted in Tanner Crab RNAseq and tagged 3665/3873, 3859/3656, Chionoecetes bairdi, Qubit 3.0, Qubit RNA HS, RNA isolation, RNA quantification, RNAzol RT, tanner crab on 7 November, 2017 by kubu4. UPDATE 20150528: The RNA isolated in this notebook entry may have been consolidated on 20150528. Instead of full sections from each histology cassette, I gouged samples directly from the tissue in each of the blocks to maximize the amount of tissue input. Used Buffer TR1 + β-mercaptoethanol (β-ME) prepared 201500505 as well as fresh Buffer TR1 + β-ME prepared today. I used aliquots of DNase prepared on 20150408. 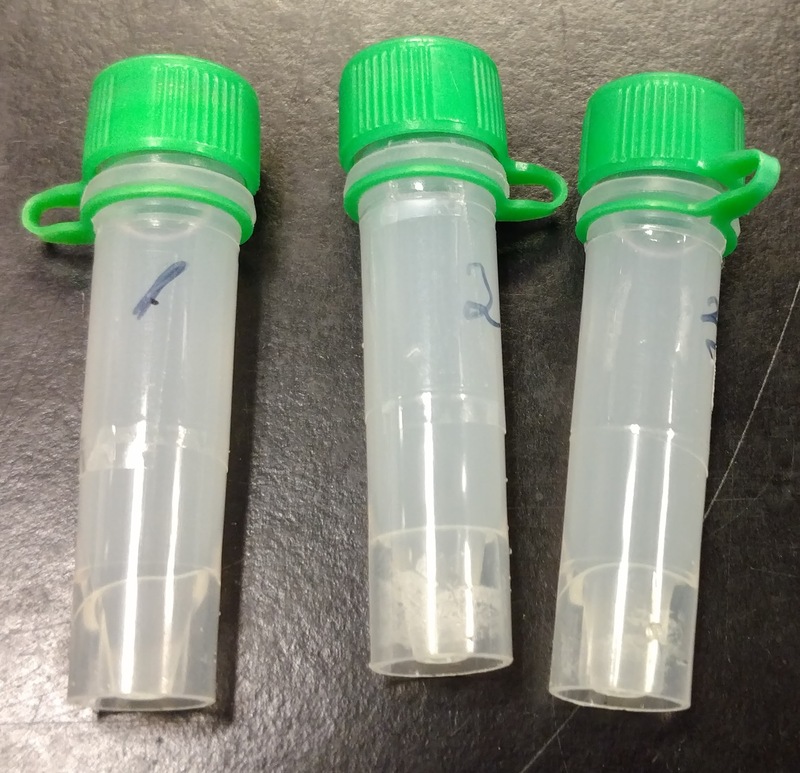 Samples were then processed with the PAXgene Tissue RNA Kit in a single group. “Max speed” spins were performed at 19,000g. Tissue disruption was performed with the Disruptor Genie @ 45C for 15mins. Samples were eluted with 40μL of Buffer TR4, incubated @ 65C for 5mins, immediately placed on ice and quantified on the Roberts Lab NanoDrop1000. All samples were stored @ -80C in Shellfish RNA Box #5. Two samples (02 and 07) produced great yields and perfect RNA (260/280 and 260/230 of ~2.0). The remainder of the samples showed little improvement compared to what I’ve been obtaining from the previous three attempts. Will discuss with Steven and Brent about how to proceed with this project. This entry was posted in Protein expression profiles during sexual maturation in Geoduck and tagged DNased RNA, geoduck, gonad, histology cassettes, NanoDrop1000, Panopea generosa, paraffin, PAXgene Tissue RNA Kit, RNA, RNA isolation, RNA quantification on 8 May, 2015 by kubu4. Isolated RNA from Jake’s Olympia oyster ctenidia, controls, collected on 20150422. Samples had been homogenized and stored @ -80C. NOTE: 0.1% DEPC-H2O used throughout this procedure was prepared on 7/15/2010 by me. Samples were homogenized with disposable pestle in their respective tubes and vortexed. Added 400μL of 0.1% DEPC-H2O to each sample and vortexed 15s. Incubated samples 15mins at RT. Centrifuged tubes 15mins at RT @ 16,000g. 750μL of the supe was transferred to a clean tube, added equal volume of isopropanol (750μL), mixed by inversion (20 times), and incubated at RT for 15mins. Washed pellets with 500μL of 75% EtOH (made with 0.1% DEPC-H2O) and centrifuged 4,000g for 3mins at RT. Repeated one time. Removed EtOH and resuspended in 100μL of 0.1% DEPC-H2O. Most samples required vortexing to dissolve pellet. Anyway, things look good. Next step will be to check for gDNA carryover in these samples and yesterday’s samples. This entry was posted in Miscellaneous and tagged ctenidia, gill, heat shock, NanoDrop1000, olympia oyster, Ostrea lurida, RNA, RNA isolation, RNA quantification, RNAzol RT on 7 May, 2015 by kubu4. Isolated RNA from Jake’s Olympia oyster ctenidia, 1hr heat shock, collected on 20150422. Samples had been homogenized and stored @ -80C. NOTE: Samples NT1 1 and NT1 2 only had 700μL of RNAzol RT in them. Added additional 300μL of RNAzol RT to each. 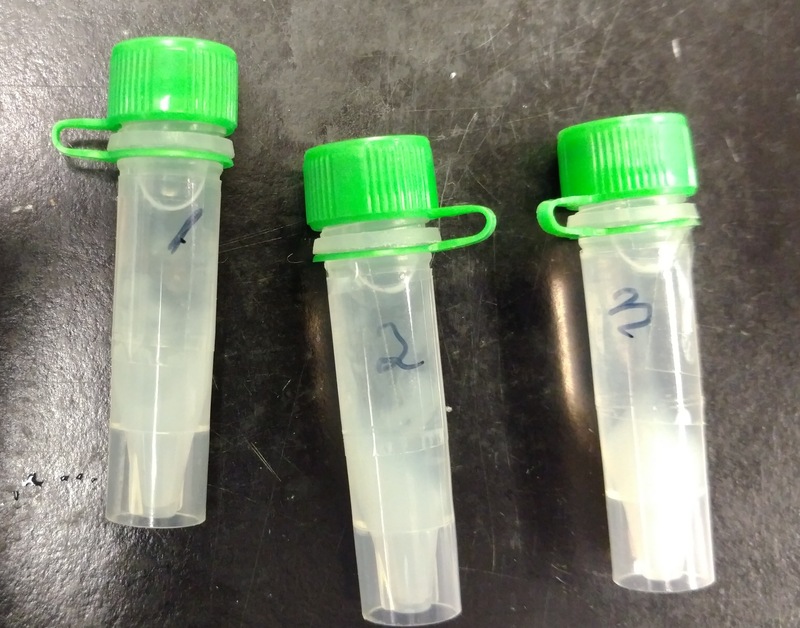 In theory, if these samples were snap frozen on liquid nitrogen after being placed in the RNAzol RT, there should be almost no impact on the RNA. 750μL of the supe was transferred to a clean tube, added equal volume of isopropanol (750μL), mix by inversion (20 times), and incubated at RT for 15mins. Overall, the samples have excellent yields. The exceptions being the two samples that had less than 1mL of RNAzol RT in them to start (their yields are actually fine, but relative to all the other samples, they aren’t great). Should I have left them that way instead of adding additional RNAzol RT? Was there something wrong with these samples in the first place and that’s why they didn’t have a full 1mL of RNAzol RT in the tube already? The 260/280 ratios are pretty good for most of the samples (>1.8), however I’d prefer to see RNA with 260/280 ratios >1.9. The 260/230 ratios are amazing! The best I’ve seen coming straight out of an RNA isolation in a long time. Eventually (once I’ve isolated RNA from the control set that corresponds to these heat shock samples), I’ll check for gDNA carryover and then, probably, DNase the RNA. This entry was posted in Miscellaneous and tagged ctenidia, DEPC-H2O, gill, heat shock, NanoDrop1000, olympia oyster, Ostrea lurida, pics, RNA isolation, RNA quantification, RNAzol RT on 6 May, 2015 by kubu4.